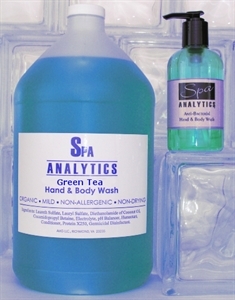 Spa Analytics Premium Organic Green Tea & Aloe Hand & Body Wash is actually three products in one. Made with Coconut Oil and Aloe Vera, this organic surfactant works great cleansing away dirt while hands and body will not be stripped of essential body oils. Our Organic Hand & Body Washes are so mild and non-irritating, that they work great as a shampoo as well. Perfect for frequent washings, and available in blends of Almond, Herbal, Mango and Cherry extracts.